The OCTP block license is located approximately 60 km offshore in the Western Region of the Republic of Ghana. Inside the OCTP license, the JV made three (3) non-associated gas discoveries: Sankofa Main in 2009, Gye Nyame in 2011, and Sankofa East in 2012 (the “Gas Discoveries”) and two crude oil discoveries (Cenomanian and Campanian reservoirs of Sankofa East (the “Oil Discoveries”). 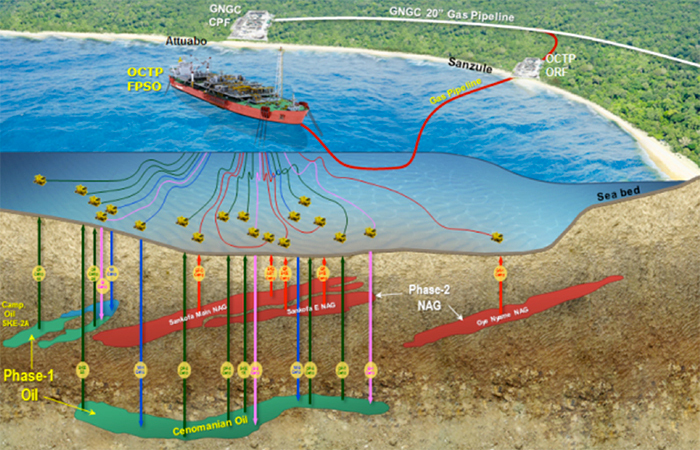 Tecnoconsult involvement started from the CONCEPT definition up to BASIC study of the subsea development system, including infield flexible flowlines connecting oil, water injection, gas injection and gas production wells to an FPSO and export pipeline conveying gas to onshore plant. Following the surveys, Tecnoconsult has developed the FEED study. Starting from survey results and Geohazard assessment study, scope of the FEED was to develop all the design activities relevant to offshore and onshore pipelines in order to enable the COMPANY to issue the Invitation to Tender (ITT) for installation.